The Eaton DR3000/A final drive assembly is a heavy duty unit suitable for any installation where a deep reduction ratio is required, typically fork lift, industrial trucks and milk delivery vehicles. Developed from the well proven DR130 design there are six regularly available ratios. Maximum output torque capacity is 3000 lbs. ft. (415 kpm) and the unit is suitable for both internal combustion and electric motive power. The final drives in this model range incorporate spiral bevel second reduction gears, taper roller bearings throughout and a four pinion differential. 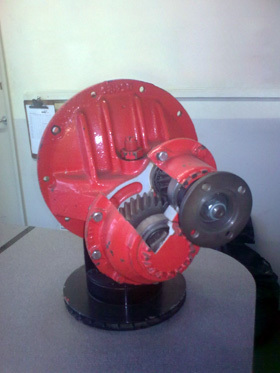 Primary reduction is made through helical gears to spiral bevel pinion. Ratio changes may be simply achieved by replacing this primary gear set. 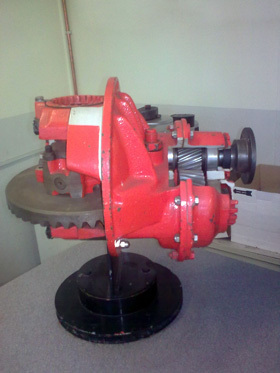 Providing casing has no damage it can be reconditioned with any damaged or worn parts replaced. Then set up on a test rig to ensure it works under load and gears mesh properly to keep the noise level down. We can supply parts for these DR3000 EATON axle units and provided your casings are in good condition we can offer exchange units. Please enquire. Click here to download a printable PDF file. Click here for a list of all our DR3000 Eaton Axle parts and spares.